Will they work on a beetle? After I took this picture I put another smaller piece of tape on the top of this piece of tape, to close the hole at the top and to make it more smooth. And it seems to work, on the first run (with tape) I noticed the engine sound was now louder than the wind noise. There was still wind noise audible. 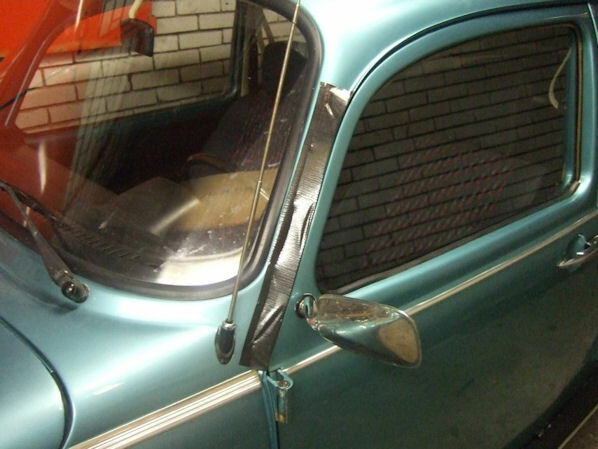 But it seemed to come from the outside mirror or the upper door hinge (which is sticking out too on the beetle). I drove on the freeway at 130 km/h (according speedometer) to a city nearby, aprox. 5 kilometers. Then drove back to my home-town on the same highway. Then I removed the tape and drove the same highway again at the same speed. The sound seemed louder, and the wind noise was louder than the engine noise. I can’t back it up with hard figures, I don’t own a decibel counter.